Vintage cars will never go out of fashion. Opulent leather seats, polished interiors and spacious saloons characterise the timeless appeal of this classic option. Features such as convertible hoods can make the journey to your wedding all the more enjoyable – so long as the weather and the bride’s hairstyle is suitable. Meanwhile, modern cars such as an E-class Mercedes, or perhaps a limousine, can add a sense of luxury to the day. 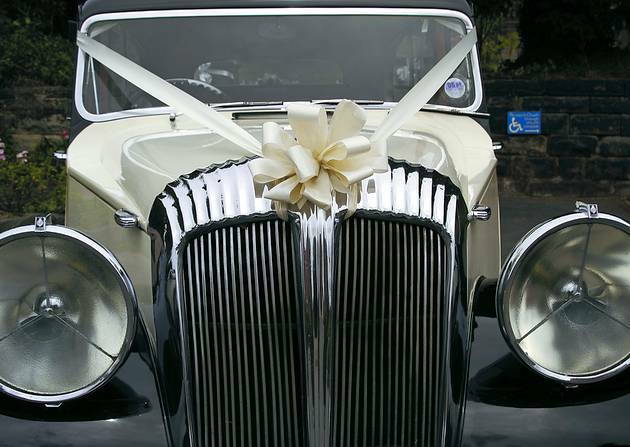 Covered in ribbons and bows to match your colour theme, these wedding cars turn heads as they pass. It you have always dreamed of a fairytale wedding you can’t get more “once upon a time” than a horse-drawn carriage. So long as the journey to the wedding venue is not too far, this is a great way to start the day. Then, after the wedding, husband and wife can escape for a few moments alone on a romantic ride. The horses look great in pictures too. For something a bit different, look for companies that provide replica vehicles from films. Perhaps you are a big James Bond fan and want to arrive in a car from your favourite 007 movie, or perhaps you love Only Fools and Horses and can’t think of anything better than turning up in a yellow, three-wheeled Reliant van. More adventurous couples might even consider arriving in a helicopter. If it’s something you’ve always dreamed of doing, but never got round to, then this is the perfect opportunity. If there’s an old classic family car rusting away in a garage somewhere, then it might be a nice project to get it back on the road in time for the wedding. If the big day is next to a river or lake, then how about a boat ride at some point. Even if it doesn’t actually take you anywhere it will add a touch of romance to the day. Once you have chosen the mode of transport – and whether your dress will fit in it, it’s important to work out a contingency plan. Cars can break down, the weather can be too wet for a horse-drawn carriage, or too windy for a helicopter, so make sure there are options in place. Most of all, choose something that is going to make you smile for years to come as you look back at photographs.